Whether as individuals or as a group, we tend to get comfortable with familiar people, familiar friends, familiar routines, familiar work, and even familiar forms of outreach. Francis and Isaiah encourage us not to fall into the bed of comfort and familiarity, but rather to move the walls of our tents to include people who are not a part of our normal social patterns, people who may not necessarily share our background, beliefs and values. I have been involved in various forms of Christian ministry for a good part of my adult life. Much of it has been peer related – young people when I was young; business people when I was in business; people who were part of my social patterns at the time. Last year I started volunteering in a local jail ministry. It has challenged me. I am not comfortable and feel like I am out of my element. I don’t see much fruit so far, but I believe God wants me to continue. God calls us to faithfulness, often without the benefit of a report card or feedback. It is our presence and love that he wants regardless of what we perceive the outcome to be. Enlarging our tents can also include how we relate to one another — family, friends and strangers. Pope Francis encouraged us to engage in “little gestures” of love. He cited examples for the family. “They are little signs of tenderness, affection and compassion,” he said. “Like the warm supper we look forward to at night, the early breakfast awaiting someone who gets up early to go to work…a blessing before we go to bed.” “Love is shown by little things,” said Francis. Loving more starts with the little things every day. As loving in the little things becomes a habit, God increases our capacity to love and sacrifice in the larger things. A habit of love in the little things will open the door to people familiar and unfamiliar, and enlarge our tents. This entry was posted in Loving Strangers and tagged Moving the Tent Pegs of our Love on September 29, 2015 by Bill Dalgetty. Where Do You Look for Meaning and Purpose? To their astonishment, these men told them that Jesus was alive! He was not dead, though he had been put to death on the cross. How incredulous the whole scene must have appeared to them. Two days earlier, they saw him die and taken down from the cross. They saw his dead body embraced by his mother as she wept. They saw his body placed in the tomb. How could he be alive? Our God is the author and creator of life. He is not confined by the boundaries of our perceptions. How often do we look for the living among the dead? How often do we search for Jesus where he is not present? How often do we look for real meaning, purpose or happiness in life where they are not to be found – in that next job, promotion or the ever-changing notion of success; in a particular friend, group of friends or organization; in a sports team, sports hero or celebrity entertainer; in that new house, boat or car; in breaking 80 in golf, achieving a perfect 300 game in bowling or completing a full marathon in record time; in food, alcohol, drugs or other unique experience? Jesus became alive and present to my friend, providing the meaning and purpose he had long sought. Ever since, he has been operating a construction business, bringing God’s presence to his employees, customers and community in how he relates to others, does business with integrity and seeks excellence in all that he does. Where do you look for Jesus – among the living or the dead? He is present to you this very moment. This entry was posted in Uncategorized and tagged Searching for Meaning and Purpose on September 15, 2015 by Bill Dalgetty. Do we look for opportunities to build God’s kingdom in the daily moments of our lives? In his letter to the Ephesians, Paul says, “Be very careful, then, how you live – making the most of every opportunity, because the days are evil.” (Eph. 5:15-16) He goes on to say that we need to understand what the Lord’s will is in every situation. Surely our day, with beheadings in the Middle East, the disregard for human life in the sale of aborted baby body parts, and the random shootings in schools, theaters and churches, is no less evil than what Paul saw in his day. Nor is our need to seize opportunities to serve God and build his kingdom any less. The key, Paul says, is to be wise and understand God’s will. This requires a mindset always to be asking what his will in every situation is, particularly with the people in our lives — family, work colleagues, friends and strangers. These opportunities are often unexpected. Once I was at lunch with a work colleague who started to share how he was estranged from his wife. He was feeling bad for some things he had done and was angry over her response. I just listened as he uncharacteristically shared his emotion over the crisis in their relationship. Though we were in a public restaurant with other patrons close by, I reached across the table, took hold of his arm and prayed that God would give him the courage and grace to reach out to his wife, and that they would both open their hearts to forgiveness and reconciliation. While I never learned the details, they did subsequently reconcile. In reflecting on the moment, I believe God’s grace prompted me to say the prayer and use it to soften hearts and bring an end to this estrangement. Jesus encouraged us to “let your light shine before men.” (Mt. 5:16) He seized countless opportunities to heal a cripple, give sight to the blind, expel a demon, open the ears of the deaf and even raise the dead to demonstrate that the kingdom of God was at hand. The Book of Acts reports that Peter and John did not pass by a crippled beggar as they entered the temple, but similarly seized the opportunity to demonstrate that the kingdom of God was at hand by commanding the beggar to stand and walk. Are we recognizing the opportunities God places before us each day to be and bring his presence to the people and circumstances of our lives? This entry was posted in Loving and serving one another and tagged Being God's presence on September 8, 2015 by Bill Dalgetty. Last week Vester Flanagan killed TV reporter Alison Parker and cameraman Adam Ward in Roanoke, Virginia, because he was angry with their employer, TV station WDBJ, for having previously fired him. He was fired because he could not control his anger against other employees involving alleged racial slurs. His allegations appeared to be more imagined than real when his discrimination lawsuit was dismissed by a Virginia state court. Anger is one of Satan’s most favorite tools in stirring up conflict in ourselves and others. Pride is the source of most anger because we become angry when our ego is offended or when we think we are being disrespected and treated unjustly. The antidote for anger is forgiveness of the offending party, which may be difficult for us without God’s grace available to us through Jesus Christ. 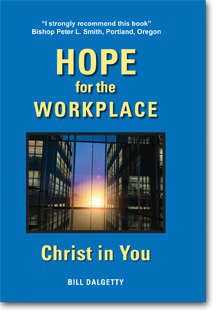 In Hope for the Workplace-Christ in You, there is a story about workplace forgiveness that illustrates Jesus’ words. Bill taught high school business classes for fifteen years. He then earned a master’s degree that qualified him to move into counseling. He initiated an application for a $250,000 grant for his school district which enabled the district to hire four vocational counselors. Bill was able to both counsel students and administer the grant. The difference between Bill’s story and Vester Flanagan’s is that Bill sought God’s grace to forgive and Vester did not. The workplace is full of opportunities for offense, hurt and injustice. Through God’s grace available to us in Jesus Christ and the power of his Holy Spirit, we need to be willing to forgive when we have been offended. Similarly, we need to be open to offering an apology and seeking forgiveness when we are the offending party. Are we willing? This entry was posted in Forgiveness and tagged Workplace Violence on September 1, 2015 by Bill Dalgetty.